Adjustable in any direction. Suitable for rails 35/40 mm. Fitted with rubber bushing and rod locking pin. All parts made of AISI 316 stainless steel. Fishing rod holder with clamp is made of mirror-polished AISI 316 stainless steel with plastic protection bushing. Height: 310 mm, bore: 39 mm, for hoses: 25/30 mm. 360° horizontal and vertical swivel; its special feature has an adjustable screw that crosses the rod holder pipe, thus there is no need to unscrew the clamp; made of precision-cast polished AISI 316 stainless steel + santoprene bushing. Suitable for pipes 22/25. Dimensions: A: 225 mm, C: 42 mm, D: 47,6 mm. Stern clamp fitting. Made of chromed brass, adjustable in any direction, fitted with rod-locking pin and internal rubber bushing. It machets 22- to 48-mm gauges. Diameter: 50 mm. Made of AISI 316 stainless steel, including the tube's base; exclusive product made by Osculati, fitted with rubber bushing to protect the rod; suitable for all fishing rods available in the market. 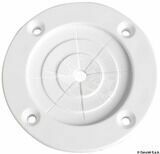 Special plastic fixing knob for easy screwing; large and sturdy base with internal rod-locking pin. Base dimensions: 100 x 65 mm mm. Rod holders`s length: 350 mm, diameter: 46 mm. 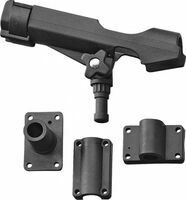 Fishing rod holder is adjustable in any direction, with rubber bush and rod locking pin. Made of chromed brass. Fixing with screws. Base dimensions: 99 x 65 mm mm. Rod holders`s length: 330 mm, diameter: 33 mm. Made of white nylon, fitted with mirror polished AISI 316 stainless steel finish frame. 60° inclination with waterproof seal cover. Hole diameter: 42 mm, depth: 240 mm. Made of precision-cast mirror polished 316 stainless steel. New oval flange, great design. Fitted with watertight cap made of white santoprene (included). Pipe diameter: 41 mm. Plate: 80 x 99 mm. Pipe length: 215 mm. NB! Base is opened. Made of white nylon and fitted with rod locking pin. Hole diameter: 42 mm. Length: 230 mm; Flange: 83 x 105 mm. Made of chromed brass with protective rubber bushing, universal size, fitted with rod locking pin. Pipe diameter: 42 mm. Plate: 90 x 108 mm. Pipe length: 215 mm. NB! Base is opened. Made of stainless steel bayonet mounting system; new version with reinforcement tension rods, fitted between the plate and the pipe, provides a safety fixed rod. Hole diameter: 50 mm, length: 250 mm. Plate dimensions: 110 x 110 mm. Wall mounting fishing rod holder. Hole diameter: 44 mm, Length: 158 mm. Wall mounting fishing rod holder is made of permanent white polycarbonate. Fitted with bracket with housing for pliers and knifes. Hole diameter: 44 mm, Length: 30 cm. Triple. Wall-mounting plastic rod holder for two rods. Dimensions: 270 x 220 mm. Pipe hole: 44 mm. 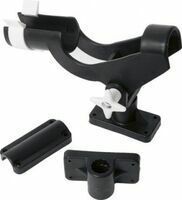 Wall-mounting plastic rod holder for three rods. Dimensions: 270 x 315 mm. Pipe hole: 44 mm. Made of nylon. 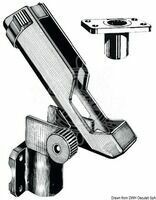 360° horizontal swivelling and locking and 140° vertical adjustment. The rod stays fit with the fishing reel set in a special hollow on the fishing rod holder. Upper rod-locking ring. Bayonet mounting system. Internal diameter: 38 mm. Length: 200 mm. Movable fin elastic bands. Bulkhead mounting. Provides support and protection for the rods. Internal diameter: 10-50 mm. External diameter: 70 mm. Horizontal or vertical mounting, black nylon body, closed-cell soft neoprene inner part. Suitable for up to 5 fishing rods. Dimensions: 285 x 54 mm, overhang: 57 mm. Sold in pairs. Rounded handrail terminal is made of mirror polished AISI 316 stainless steel. Base diameter: 35 mm, Height: 57 mm, for hoses 25 mm. Type - blind. Rounded handrail terminal is made of mirror polished stainless steel. Base diameter: 35 mm, Height: 57 mm, for hoses: 25 mm. Type - crossing. Rounded handrail terminal is made of mirror polished AISI 316 stainless steel. Base diameter: 35 mm, Height: 57 mm, for hoses 22 mm. Type - blind. Made of polished AISI 316 stainless steel, designed from pipe and plate coupled with argon welding, high-quality finish, hand mirror polished. Size: 56 x 42 mm, hose diameter: 25 mm, angle degrees: 90°. Made of polished AISI 316 stainless steel, designed from pipe and plate coupled with argon welding, high-quality finish, hand mirror polished. Size: 56 x 42 mm, hose diameter: 25 mm, angle degrees: 60°. Made of polished AISI 316 stainless steel. High-quality finish, mirror polished. Size: 56 x 42 mm, diameter: 22 mm, angle degrees: 90°. Made of polished AISI 316 stainless steel. High-quality finish, mirror polished. Diameter: 22 mm, angle degrees: 45°. Made of mirror polished AISI 316 stainless steel. Pipe length: 2 m, diameter: 25 mm.